it’s been awhile since i’ve written…let me explain. hard to believe, but just twelve weeks ago today i underwent emergency hip fracture surgery on the island of kauai. many of you know the story, but for those that have not heard, following is a brief synopsis. dave, domenica and i decided to hike the kalalau trail, na pali coast, on the last day of our summer vacation in hanalei. 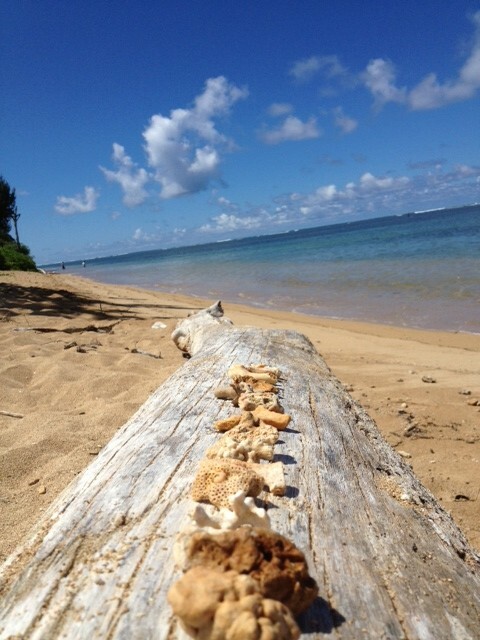 we got an early start, parked at the trailhead, had snacks and gear packed for an afternoon snorkel. the trail conditions were optimum—dry and clear weather. we quickly arrived at hanakapi’ai beach (2 mile marker) and decided to climb two more miles to the first waterfall. we continued at a relatively brisk pace and the surrounding rainforest and bamboo groves were magical. domenica and i commented on a tiny cleared space for helicopter landings…wondering why it was there? little did we know, that a few hours later we would await a rescue helicopter at this very site. we waited for 40 minutes and then continued onto hanakapi’ai beach where the helicopter and rescue crew flew me to princeville airport to transfer by ambulance to wilcox hospital in lihue. you see, i never made it to the waterfall because i fell on a boulder while crossing a stream. the fall was of sufficient force to cause multiple fractures in my left upper femur. with the help of a stranger (and saint?) named art, dave carried me down the trail on his back, my leg dangling. domenica ran 3 1/2 miles to the trailhead for lifeguard assistance. i did my best to breathe and think positive thoughts. after all, the next morning was our flight home and we still had LOTS to do on our last day. however, the doctors informed me that i would not be going anywhere until i had interotrochanter hip surgery complete with pins, plates and screws that will remain in my leg forever. a day and a half after surgery we flew home. i cannot tell you how good it was to see domenica at the airport and return home to cardiff! though this setback has been a challenge in many ways (think: no driving, needing shower assistance, not able to get socks on! ), it has also reinforced what i already believed in my heart: family and friends want to help and are truly compassionate. it has also reinforced my belief that the foods we choose to eat, the thoughts we choose to think, and the company we choose to keep, all influence our bodies, minds and spirits. so, watch your step; eat healthy foods; keep moving your body and stretching your mind daily. above all, don’t take ANYTHING or anyone you love for granted. heartfelt thanks to everyone who visited, provided food and comfort. much love especially to dave and domenica—in times of distress, the love of family is what gets us through each day. enjoying the flavors (and colors) of summer! they say we inherit personality traits, physical resemblances and health issues (good and bad) from our parents and generations past. 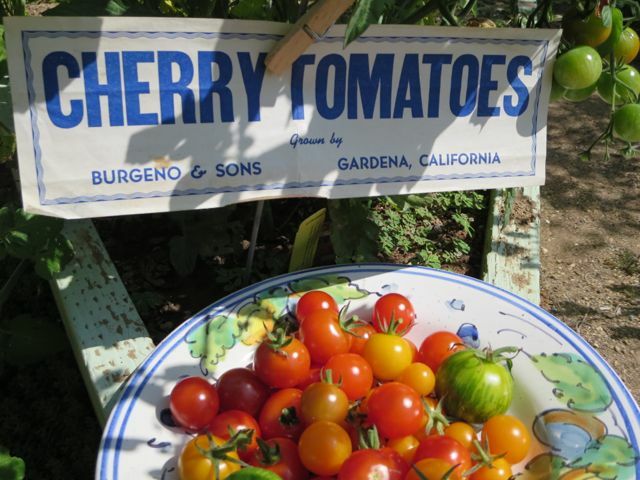 well, not only did i inherit the desire to farm (albeit on a very small scale in our frontyard triangular beds), but the absolute need to grow, pick, eat and create summer dishes using a variety of cherry tomatoes. some people crave sweets, others have shoe fetishes, but i am a self-admitted cherry tomato addict. i don’t choose to eat them because they are filled with lycopene and healthy phytonutrients, though this is a bonus, i choose to grow and eat them simply because my entire sensory being craves the sweet/tart pop of the freshly picked fruit. my husband likes to tell the story of a time a few years back i confided that i thought i might need to stop ingesting acidic foods. tomatoes, being highly acidic would be banished from my diet. he likes to end the story by relaying to listeners that i started crying at the thought of not eating one of my all time favorite foods. he is not embellishing the story…i did cry, briefly. faced with this difficult decision — alkaline v. acidic stomach, the tomatoes won out! and, i am happy to report that my health seems perfectly fine. there are SO many ways to use the colorful little orbs of sunshine in your kitchen. of course they are an excellent and lowfat snack, but can also be the focal point of a summer dish. as mentioned above there are also many health benefits derived from eating fresh and cooked tomatoes. one such benefit is skin protection and the reversing of wrinkles. well, heck, who wouldn’t want to do that?! my adorable papa turns 85 years old on tuesday, 23rd july 2013…coincidentally he has no wrinkles, his hair is thick and full, his mind and body are agile. most importantly, though, he still enjoys his fruits and vegetables, amongst them the beloved cherry tomato. happy birthday, papa… and thank you for sharing your life with me, rick, rob, margaret, your grandchildren, and mom (helen). you are an impressive role model of what it means to be kind, gentle, bright, charismatic, appreciative, hardworking and generous to your fellow humans. to celebrate the summer solstice, i thought i’d pass along a simple and healthy “suggestion” for just what to do with the plentitude of beautiful, fragrant and mouthwatering stone fruit the season graciously bestows upon us. after packing up domenica’s dorm room, filling every inch of our car with college supplies, we headed home. though we had only been away for a couple of days, we were pleasantly surprised to discover that our own santa rosa plum was in full production. branches were drooping from so much fruit, many plums so ripe they had fallen to the ground. 4 quarts mixed (or not) pitted/quartered stone fruit (we leave the peel on); 1 lemon zested and juiced; 1 vanilla bean (optional); 1/2 cup sugar…that’s it! put all ingredients in a heavy bottomed pot and bring to a simmer for 30-45 minutes or until somewhat thickened and bubbly. stir occasionally and try not to break up the fruit too much. let cool to room temperature and spoon into clean jars or freezer containers. at this point you can refrigerate and enjoy for up to two weeks or freeze for wintertime enjoyment! 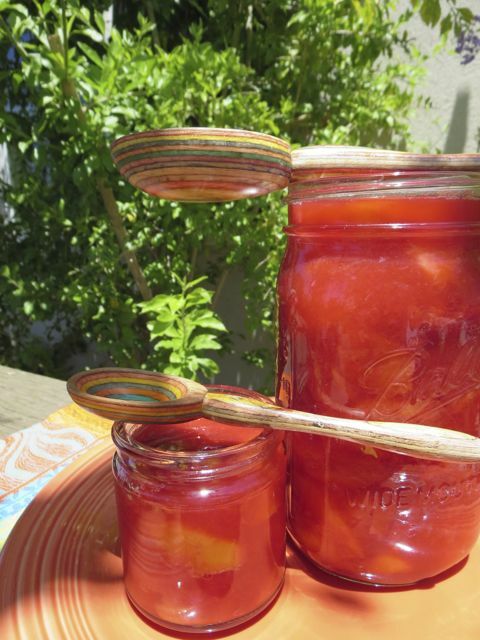 the compote is versatile…spread onto toasted country bread with sweet butter, spooned atop greek yogurt or vanilla bean ice cream…it is the essence of summer in your mouth. there are many pleasures to be had during the summer season ahead, but harvesting ripe fruit, creating something simple, healthy and delicious is amongst the best…only made better when your daughter is home for summer vacation and you can enjoy the fruits of your labor together. this is going to be a fun/memorable summer! a favorite shot…domenica harvesting some blackberries! happy mother’s day to all you special women! though my daughter is away at school and unable to celebrate the day with me (she did text first thing this morning! ), today brought forth a powerful reminder of her presence in our lives. this afternoon we harvested our first bowl of plump, juicy, sweet, perfectly ripened blackberries from our backyard vines. 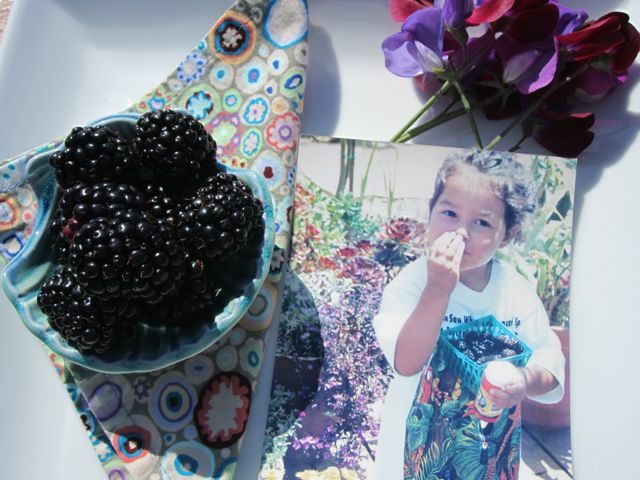 domenica has grown up (see photo) harvesting the ready to eat blackberries since she was a toddler. when she was born we planted three small vines which have mushroomed to maybe fifteen. this isn’t counting the stray vines we’ve given away. i have fond memories of her harvesting, eating as many as she put into the colander (the best part of picking!) and having deep purple stains on her hands, mouth and shirts. when she was old enough to assist me with baking, we’d make muffins with blackberries as a focal point or cook up some refrigerator jam (for ice cream and yogurt). recently, though, we’ve graduated to blackberry cobblers, claufoutis and galettes. so easy, loaded with fresh fruit, colorful, flavorful and relatively healthy as desserts go. we often add nectarines or tart apples to our dessert creations then bake until golden and bubbling. yum…i can smell them now! and don’t forget about adding them to your salads for a burst of sweet/tart goodness…more blackberry posts with recipes will be forthcoming, i suspect. these simple pleasures and memories will remain in my heart/mind forever and remind me of the beautiful and fulfilling bliss it has been to have a child. i hope your day has been filled with lovely memories as well. p.s. domenica planted the sweetpeas (from seed) in the above photo when she was here for her recent winter break. there are literally hundreds of blooms now, bringing loads of bees and adding a sweet scent to our front yard garden. i suspect one of these days domenica will enjoy a garden of her own…that would make a mother (and dad) proud. 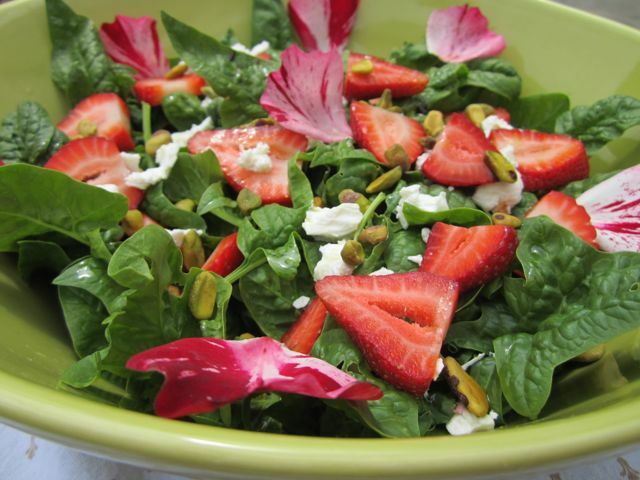 celebration of spring strawberries salad! 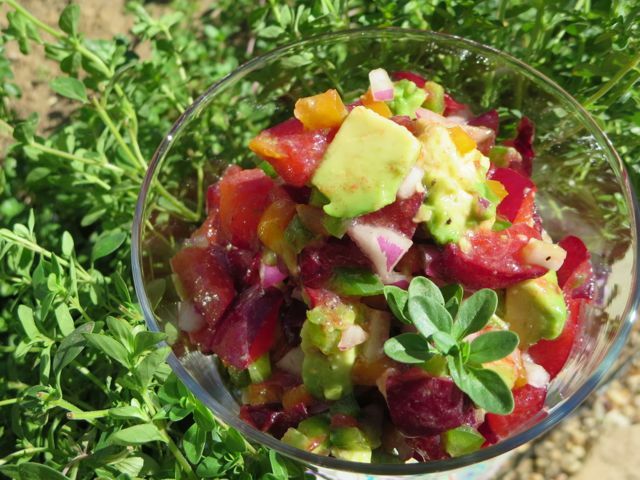 NOTE: you can make this a main dish salad by adding grilled or poached chicken; seared or broiled ahi; or roasted tofu cubes. i added some 4th of july rose petals for extra color! can’t wait for summer 2013 dahlias! in “celebration” of earth day (which in my opinion should be celebrated everyday), we planted sixteen dahlia tubers yesterday. the bouquet pictured above are a few of last year’s blooms. 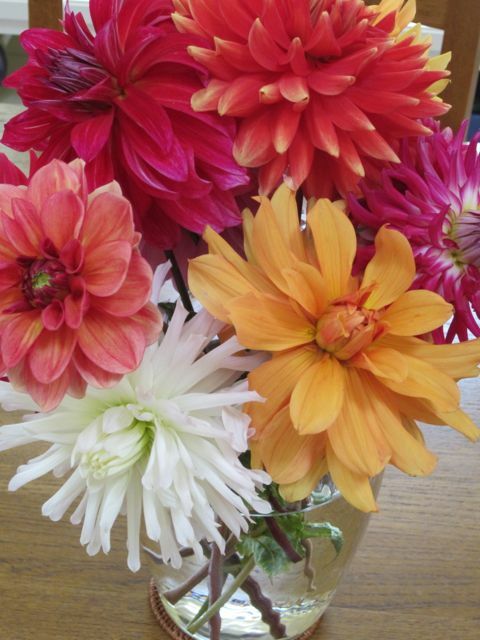 this season i chose sixteen dahlias of varying shapes, sizes and plant heights…all extremely “colorful”. sometime in july/august we will be cutting dahlias by the dozens to share with friends, neighbors, family, local businesses, co-workers. maybe i’ll give away dahlia bouquets on the street corner?! yesterday the elements conspired perfectly with our dahlia planting “mission”. it was a beautiful spring day…sunny and warm with a slight breeze. though we have a variety of plants growing in our yard: flowers, fruit trees, vines, succulents, vegetables, herbs…the dahlias hold a special place in my heart. you see, my italian nonna (grandmother) grew dahlias. she would take me and my siblings out to her extensive garden and as she clipped the blooms, she would hand them to us for bouquets. thinking about those days in her garden, i can hear her chatting in italian (animated!) 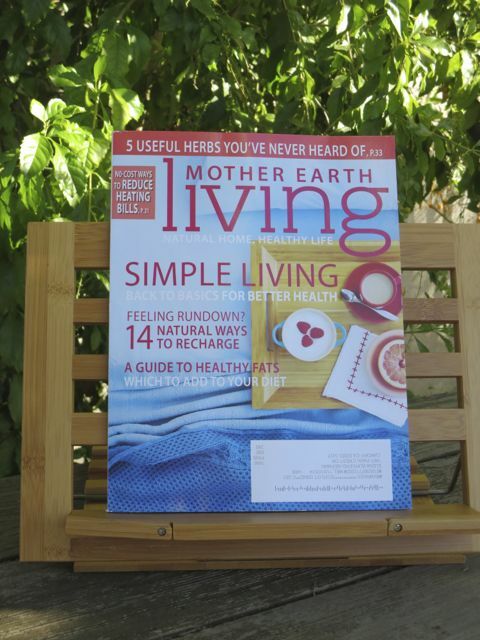 and instilling in us a love for nature, food and the bountiful earth. thankfully she and my nonno lived only one mile away and visiting was frequent and fun. i hope you enjoy this bouquet of dahlias…and perhaps be inspired to plant a few yourself! 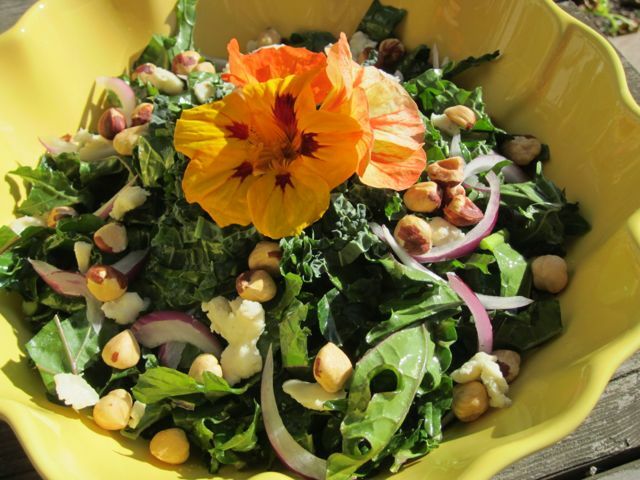 when life gives you kale…make salads, pesto, chips, stir frys! the energy of the afternoon changed with a welcome phone call from my girlfriend, chacha. though we’ve recently connected after being acquaintances for years, our newfound friendship is a blessing to me at this period in my life. we are both empty nesters with our daughters off to college and we enjoy many of the same passions: cooking, gardening, nature, pottery, photography, reading and traveling. yesterday she called to ask if i would be home as she had picked a bouquet of lavender for me! “would you like to trade for some greens?” she asked. she and her husband jon rode over on their bikes for a visit with dave and i. chacha and i chatted while clipping snowpeas, english peas, lettuces, chards, beets and beet tops, loads of kale, and guavas. 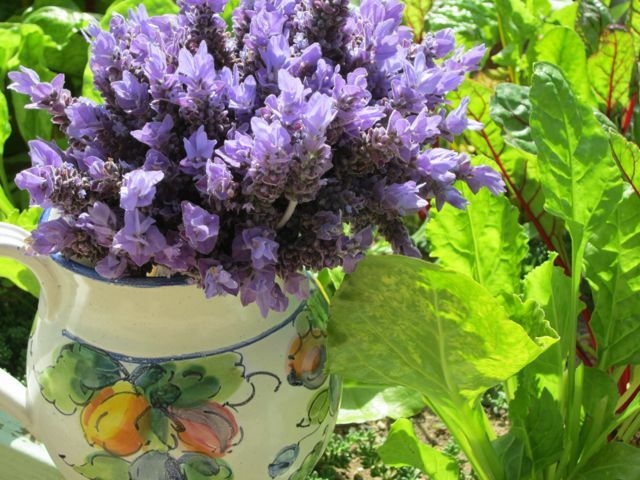 in her beautiful colombian accent she exclaimed that she didn’t have to go to the farmers’ market because she could find what she needed at my house…she felt fortunate that we could barter lavender for greens. i thought to myself that this impromptu visit is the true meaning of friendship…sharing the abundance of what we have and enjoying an afternoon outdoors in the garden. i wish you could smell the lavender…certainly a treat for the senses (and “colorful”).